Let's talk about pattern charts and pattern diagrams. 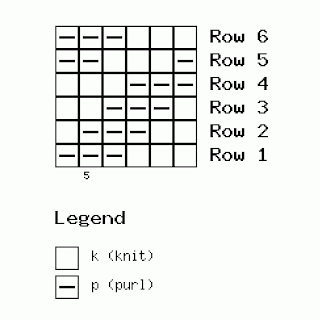 A pattern chart is a readable, visual list of symbols which represent the knitting stitches that form your pattern. When working in colors (usually in stocking stitch) a knitting chart helps you to visualize how to place the specific colors. 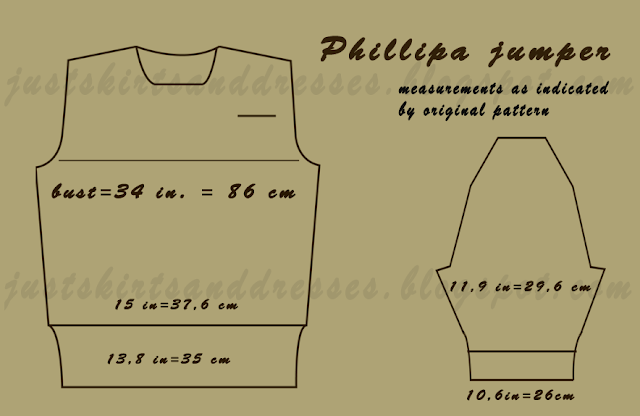 A pattern diagram gives you a general idea of how your pattern pieces should look like, with the right measurements. The diagonal pattern of the Phillipa jumper is very simple, yet decorative. It consists of groups of 3 knit and 3 purl stitches shifting diagonally in every row to one side. The direction changes halfway the yoke. You will notice that most vintage patterns doesn't include charts, only a lot of text. This means you need to be very careful not to miss anything, but also, there is a possibility of printing errors. The solution: make a visual chart and make a swatch of the pattern. I like to work with visual charts, as it makes for me easier to spot mistakes both in the pattern description and in your work as well. A chart also helps to place your stitches in the right spots. A visual chart represents the stitches of your pattern as seen on the right side of the work, from the bottom up. When you knit you 'read' the uneven rows from right to left as they are. You need to reverse the symbols in even rows and you read them from left to right. If you knit in round you 'read' every row in one direction, from right to left. I would certainly advise to make a swatch of the pattern before starting to knit your garment. This way you get to practice and see where the difficult parts are or where you need to pay more attention. Below is the chart I made of the yoke pattern, following the pattern instructions. As you can see Row 1 and 6 are exactly the same! So there is an error in the description: the pattern calls for repeating the 6 rows of the pattern but actually, you should only repeat the first 5 rows. The pattern base is 3K, 3P which makes a total of 6 stitches. Your gauge may change when working on a (lace) pattern and the last thing you want is a partly stretched out garment. Well, it happened to me! I started to knit the bodice in round and when I changed to the diagonal ribbing of the yoke, somehow my knitting became too loose. Of course, due to a lot of knitting in the evening hours I only saw this when I finished the front up to the pocket level. It was a painful but right decision to start again. I ripped the yoke out, picked up about 250 stitches and started in pattern again by using a 0.5 size smaller needle. Changed from metric 3,5 to metric 3. This gave me the same neat and tighter structure as the bodice. did you know......that wartime garments often used patterns made up with simple knit and purl stitches or lace patterns because those required less yarn than cables and intricate 3-dimensional shapes? both for the front and the back. Next post: Knitting separate pieces or knitting in round?